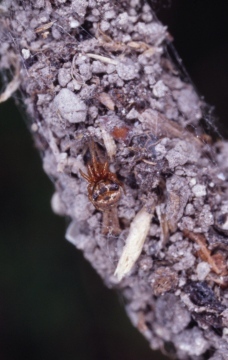 It is my opinion that there is no definitive Larinioides cornutus retreat, it is something each spider creates depending on the precise situation of the web and vegetation, so whilsts their retreats will have similarity, nothing will identify the retreat to the species. Even with the presence of an orb web you could not be certain it was not a different orb web spider - many species make a retreat. It is not therefore possible to identify the spider to species level from either the retreat, web or egg sac. 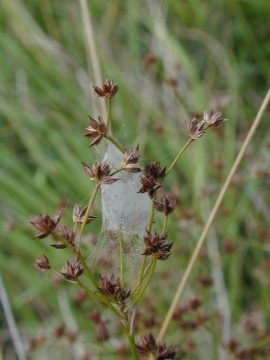 There are practically no spiders which can be identified in this way, the egg sacs of the tiny theridiid Paidiscura pallens being one example of very few where one can identify the spider responsible (see Paidiscura pallens summary page). Generally (of course there are always exceptions) whole families spin similar webs and whilst some clues might narrow then range of possibilities, none will enable reliable species identification, at best educated guesswork with a range of answers. Thanks for your comments Peter and Evan. 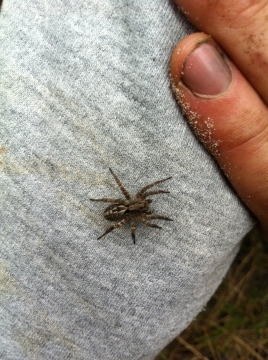 Where would I find pictures of what is definitely a Larinioides cornutus' retreat to compare against my photograph? For some of my purposes the identification to possibly or probably is better than totally unknown. I did check against my original photos and there are a couple of lines going downwards - but probably not enough to know for certain whether there was an orb web below. It certainly looks as though your spider will be Achaearanea riparia and a very nice find. It would be good to get confirmation though. I thought you might like to see these less-than-brilliant photos showing the spider that I found on its retreat last month (see posting, 21st September) and which I thought might be A. riparia. I know you said that confirming the ID would be a microscope job, so I'll revisit the site next year and see if I can collect a specimen. Thanks for the postcode. Steatoda nobilis is already in the area (see http://srs.britishspiders.org.uk/portal.php/p/Summary/s/Steatoda+nobilis ), so I would not assume you brought them with you. I doubt there is anything effective you can do to get rid of them and they would certainly re-appear from the wider area anyway. I think it is a case of getting used to them in the same way we tolerate social wasps (and honey bees, which both have more potential to sting and cause problems). I have checked around my property and can see numerous scaffold type webs especially on window frames. My neighbours have also got the same webs on their windows. I have also seen a few of the garden spiders you mentioned. I experienced an outbreak in both the Bletchley area where I worked and in Leighton Buzzard where I lived last October. This was reported in the local papers at the time and were confirmed as Steotoda Nobilis. I did bring one with me when I moved in October, it was in my garden furniture, there were also egg sacks which I collected, no one seemed interested so I destroyed them. A year on and they are back, this time in very large numbers. Although I appreciate that they may not attack humans intentionally I don't really want to take the risk with small children. I feel responsible for bringing them to the area to be honest, but there's only so much checking you can do. Environmental Health Pest Control for the local council are not interested and don't see the point in calling pest control as the whole estate would have to be done at the same time, which I can't see happening. Are there any kind of deterrents I could put in place that you know of? I am open if anyone would like to come and collect specimens. There are adults both male and female of varying sizes and juveniles. My postcode for the records is: CV114XY Thanks for taking the time to educate me more on the species, it is very much appreciated. Yes, your picture shows Steatoda nobilis, the so-called 'noble false widow' spider. However Steatoda spiders make 'scaffold' webs in out of the way corners or gaps and S. nobilis also has a tubular retreat that is at least partly concealed in a deep crack or hole - so the webs criss-crossing your garden are not going to be false widow spiders and the Steatoda spiders are not normally likely to come into contact with humans unless disturbed. Can you provide a postcode or map grid reference for the location, so that we can add your record to the recording scheme? 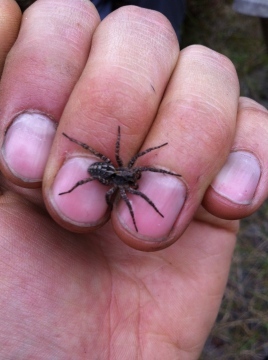 Can you check out the pic titled 'False Widow 211012' it is in recently uploaded pictures. I believe this to be the Steotoda Nobilis, of which I have caught 6 since Friday. If you could confirm it would be appreciated. Webs criss-crossing your garden are not going to be false widow spiders, but are almost certainly garden spiders Araneus diadematus, an abundant and highly visible spider at this time of year. 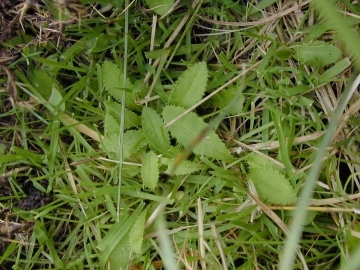 These are harmless to humans and occur in almost every garden in the country. There are a number of Steatoda species found in Britain, all so-called 'false widow' spiders. Three are possible in or near buildings, S. bipunctata (very widespread, probably occurs in almost every building or outbuilding in the country), S. grossa (widespread and sometimes very frequent in the southwest, but becomes much scarcer further north and east, but in the last few years seems to be increasing) and S. nobilis, the one which gets the press for biting humans (originally confined to the south coast, now increasingly turning up elsewhere in southern England and found in 2006 in Barry, S. Wales). 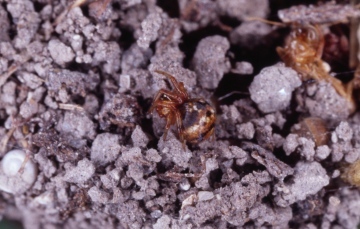 Steatoda nobilis has on occasions been responsible for bites, even though many of the cases publicised for this are almost certainly due to another cause. It is extremely unlikely indeed that your false widows would be this species, since this would be a very long way north of any reliable records of this species. I can't tell which species of false widow or other spiders yours might be without the actual spider or a reasonable quality photo which shows to upper abdomen patterns. I moved from Bedfordshire to Warwickshire, Nuneaton, last October from a property infested with false widows. Suprisingly enough I have brought them with me. My whole estate was infested with them and my attic was floor to ceiling webs and my outhouse and garage was also. I had not seen them in over a year till this October. I went into my garden this morning and it was like a scene from arachnopobia. There were webs criss crossing from patio furniture, from the house to the top of bins, my shed is covered and all of my window frames and neighbours. I had them identified at my last property and can confirm they are false widows. I believe there might be numerous species. I have caught 5 today and have no doubt that this is a lot larger than the infestation I had last year. There are babies, fully grown males and females. I feel quite bad to my neighbours for bringing them into the street! Is anyone interested in collecting them or has any advice how to get rid of them? I normally don't like killing anything but I do have young children and the quantity must be in the hundreds at least. Think its a L. c. newly spun retreat. They get covered with various bits of plant and prey as time goes on. The slipper shape with the opening facing down is typical. 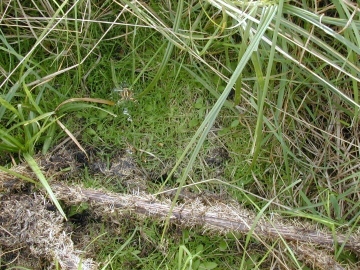 Also the location on tip of a Juncus means wetland and the place is typical for the species. Just a guess but I have seen a lot of them. I bet there was a web or bits of the main lines next to and slightly below this. But you are right Peter could be something else. If Larinioides cornutus, there would also be an orb web, so the question is, was one present? Even then I would be reluctant to say that the spider responsible could be pinned down to a single species on the basis of a retreat and web alone. I am going to guess Larinioides cornutus. It could be any number of spiders, possibly a Clubiona or Cheiracanthium species - but an adult under a microscope would then be needed to identify to species level. Does anyone know what makes this web on the seed head of a species of rush? You can't add pictures to species notes I'm afraid. However the collaborative page with a link near the bottom of the Summary page is available to any logged-on user with member status. I have accorded you this status, so that you could add text and images relevant to a species on this. Pictures should be showing something of interest to the spider or its habitat or behaviour, etc and not lots of the same, but otherwise there is no set limit other than common-sense. What pictures should I add to a Species Description? How many pictures of each species are required? Should each picture be distinctly different from any already shown? Should pictures showing features of the web eg stabilmentum be shown? as it is associated with her web if not actually made by her? What about photos of web without the spider itself? Can photos be included in Species Notes? at the appropriate points in my notes on the notes page for this species. Is this possible? A good quality glass hand lens of x10 or x15 is what you need, x15 more difficult to use because you have to get closer to the spider through the glass. If you can determine that the spider is definitely adult, by sight of the complex adult male palp or female epigyne, then the male would be distinguished (in this country) from A. barbipes by having a similar abdominal pattern but no black hair brush on front tibiae and metatarsi. Female epigyne is more problematic, since it will almost certainly be mostly obscured by hairs, preventing the shape and other details from being reliably seen (and in any case figures are always drawn of these structures in alcohol, and in air the appearance will not be the same. From the Sweden photographs, it does look as though the dark or black underside may be a reasonable field character. Thanks Peter, those comments are very helpful. What magnification on a hand lens would you recommend for being able to get a close enough look at the epigyne/palps? The site my colleague had a record from was Hankley Common, where we also do some management work. I checked with him and he is going to try and locate his diary entry to find out exactly when he recorded it, but thinks it was roughly 10 years ago. I completely understand the apprehensions regarding the ID, and in my colleague's instance, I believe it was field ID only he was relying on. However, he was being advised at the time by Jonty Denton, so there is a good chance the ID was accurate. We are working on Hankley next week, so I will try to get a GPS of the exact location, and any other details I can get from him. An accurate ID of the individual requires (1) adults and (2) microscopical or very clear lens examination of palp/epigyne. From the legs I would think your photographs are pretty certain to be of a juvenile Alopecosa, but almost certainly barbipes which can be numerous in suitable habitat on southern heathlands, as well as chalk grassland and lichen heath habitats on other dry grasslands. Adult female Alopecosa barbipes can also be pretty large, so even large size can't be taken to be more than an indication between barbipes and fabrilis. However a good quality lens and examination of palp or epigyne would probably enable an adult male or female to be distinguished from A. barbipes when confined to a tube (but the epigyne will be very obscured by hairs, so even this would not be easy) ) and the adult males of A. fabrilis would not have the brush of long black hairs on tibiae and metatarsi 1. I would be interested in the record of Alopecosa fabrilis on one of your sites a few years back and which site, since the last record we have in the recording scheme is from Hankley Common in 1990, the only modern site and with Bloxworth and Morden Heaths the only other sites - but bearing in mind that the spider can easily be confused with A. barbipes if field identification is being relied on, especially by someone not very familiar with both species and the range of size, pattern and colour of both juveniles and adults (and I don't know of anyone alive in this country who would be!). Locket & Millidge in British Spiders state that A. fabrilis is generally darker than A. barbipes, especially on the ventral side of the abdomen, but this will almost certainly apply to adults and not necessarily juveniles, and these things are not going to be definitive on their own without a voucher specimen. Internet images certainly suggest that adult fabrilis in Sweden have black underside. Crooksbury Common appears quite close to Hankley Common, so it would be very good if you were able to find an adult for critical examination. I have tried to identify it and think it is more likely to be A. barbipes than A. fabrilis, mostly due to the rarity of A. fabrilis. However, I would greatly appreciate it if someone could provide me with an accurate ID of the individual. Also, is anyone is aware of any tips for identifying A. fabrilis in the field? I have heard that they are completely black underneath. Thanks Peter, have sent an e-mail to Mike Davidson but have not heard anything back yet. Wait with anticipation although did spot on European Spiders something similar - Leiobunum rupestre. Have been checking the outside walls since for other examples.